Now that EU and Britain are proceeding to the next level of Brexit talks, Cable might be seeing an uptrend for a while yet. Here’s a setup for those who are bullish on the pound! As you can see, GBP/USD is being supported by a rising trend line on the 1-hour time frame. Unfortunately for the bulls, the pair found resistance around the 1.3500 major psychological handle and is now headed fast for the 1.3350 levels. This is a good thing if you’re looking for retracement entries, especially since the 1.3350 handle lines up nicely with not only a 61.8% Fib retracement, but also this week’s bottom weekly ATR. What’s more, it’s also a jump away from the trend line support! On a fundamental basis, the pound could continue its uptrend over the next couple of days. Now that Theresa May and her team have successfully brought negotiations to the next level, investors – who fled on the back of Brexit-related uncertainty – can slowly come back to erase the pound’s post-Brexit losses. Gotta be careful, though, because the Greenback has a couple of things going for it. For one thing, the U.S. Congress and Senate seem to be on fire these days after passing their versions of the tax bill AND averting a government shutdown this week. And then there’s today’s jobs numbers, which were generally well-received by market players. Last but not the least is the highly-anticipated Fed rate hike this month. While a lot of traders have already priced it in, others might still take advantage of increased volatility surrounding the event. For now, I’m looking for signs of a bounce around the 1.3325 – 1.3350 area. And with stochastic already in oversold territory, I don’t think Cable will stay in its current levels for long. Long at 1.3350, SL below 1.3300, and aim for last week’s highs near 1.3550. How about you? 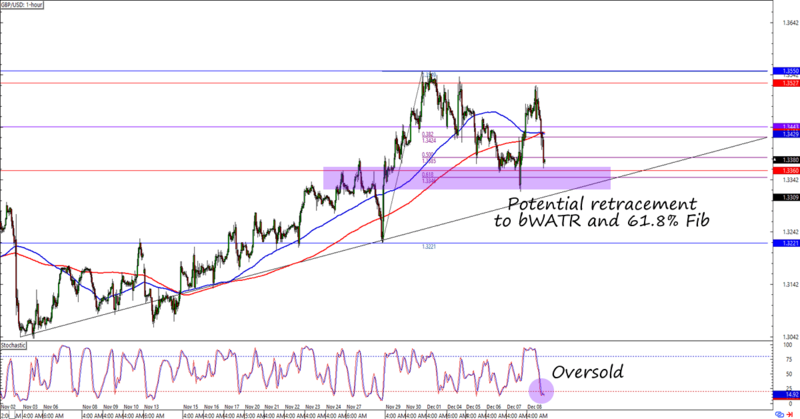 Which direction do you think GBP/USD will go?